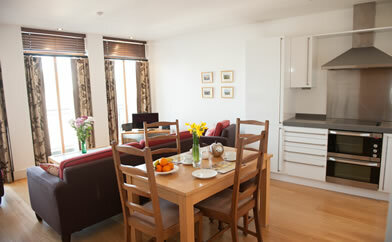 Bridge Street Apartments are luxury self-catering apartments occupying a prominent riverside position in the city centre of Inverness, the capital of the Highlands of Scotland. Holidaymakers and business people alike will appreciate modern accommodation in the city centre with secure parking and free wireless internet. The stylish flats are ideal for a city break to explore shops, restaurants, bars and the superb amenities Inverness has to offer. You can visit Eden Court theatre or cinemas, meet up with friends and relatives while enjoying the freedom and independence of your own place. 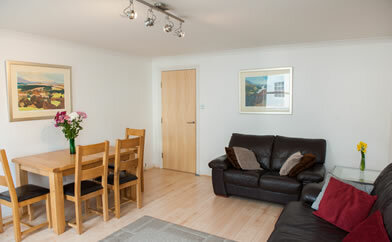 The apartments are available for a short stay and well suited to a longer vacation rental. Inverness is the gateway to the Highlands and from here you can explore the mystery of Loch Ness, visit ancient castles, learn about their dramatic or romantic history and appreciate the serene, wild and spectacular scenery of the Highlands. Apartments 401 and 405 are in the same building in the city centre. They are located at the side of the building where it is quiet. Set back from the main street, you will enjoy the tranquility Neither traffic noise nor the bustle of the city’s nightlife will disturb you. Both apartments have secure underground Garage with allocated parking space, Secure Entry System, Elevator, Balcony, and free Wifi. ‘River Walk’ being ten minutes away from the centre has a quiet location, an allocated parking bay, secure entry system and free Wifi. 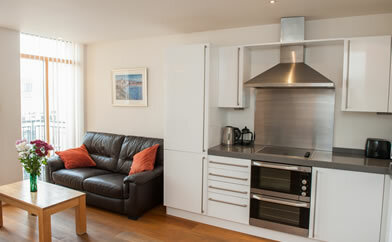 It is a good-size apartment with separate kitchen and lounge.